SUBHEAD: How the most evil corporation in the world gets it completely backwards when it come to the truth. 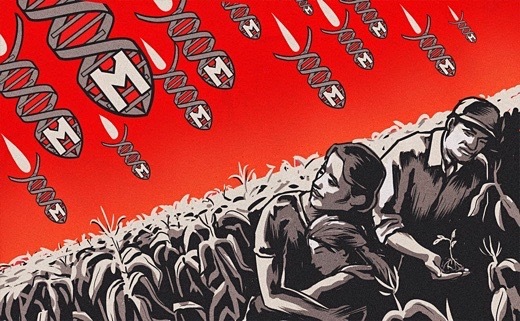 Image above: Monsanto's genetic hellstorm on food security and self reliance. From (http://www.activistpost.com/2015/05/shocker-court-document-asserts-hawaii.html). About a week ago I was scrolling through an article at www.ZeroHedge.com for news few others are reporting. I was doing this through my iPod6 at 3:30am. That's when I usually gathering possible stories from various sites that are getting out at the start of business on the US East Coast. ZeroHedge is a commercial site with plenty of ads inserted into each article. Often ads are targeted to you based on Google searches you might have done or purchases completed recently. But the ads in the article I was reading were from one company I have had no dealings with... MONSANTO... specifically from MonsantoHawaii.com. The gist of the contents of the ads were public relations pitches for how many wonderful jobs Monsanto was bringing to Hawaii. How Monsanto was restoring the health of the agricultural industry in Hawaii. These ads all included the images like one of a tall, young, healthy Hawaiian man standing among green rows of crops as if it were a small healthy cornfield in Indiana. The pitch was mind boggling effort to show how Monsanto was either making a safe environment for bees; or encouraging biodiversity of the environment, or saving habitat for monarch butterflies. It’s part of an effort at Monsanto to improve the St. Louis-based company’s image. Earlier this year the Harris Poll on corporate reputations ranked Monsanto third worst in the country, just behind BP. One of the ads Monsanto produced was this television spot titled "Dinner's Ready: Let's Talk About Sustainable Food". Don Draper of Mad Men could not have done it better. "It's time for a bigger discussion about sustainable food. Because growing enough for a growing world, and doing it in a sustainable way, requires a wide range of ideas and solutions. Pull up a chair. Be part of the conversation at Discover.Monsanto.com." Video above: Monsanto's Dinner's Ready ad released November 5th 2014. From (https://youtu.be/c6hY5-zcC9g). 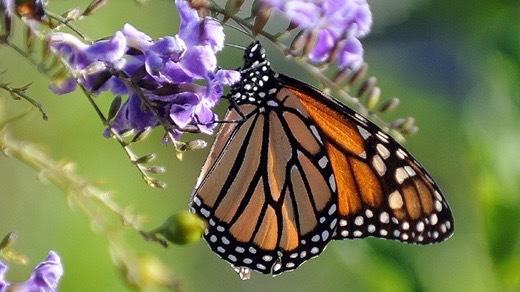 Image above: Stock photo of monarch butterfly from page of www.MonsantoHawaii.com. Monsanto Hawaii farms have become havens for the monarch butterfly. Through Monsanto’s monarch butterfly program, nearly 100 thriving crown flower plants have been added to the Kunia and Molokai farms in an effort to increase the butterfly’s milkweed habitat and protect biodiversity. According to Oberhauser, the use of Roundup has destroyed the monarch butterfly’s primary food source, a weed called milkweed that used to be commonly found across North America. As the agriculture industry boomed and farmers effectively eliminated the weed from the land in order to maximize crop growth, she was able to catalog a parallel decline in the butterfly’s population. For its part, Monsanto noted that herbicides aren’t the only reason the monarch is dying. The company cited studies that showed the butterfly’s population in Michigan and New Jersey were not shrinking, though scientists have dismissed those studies since they focused on areas where milkweed was still prevalent. Image above: Stock photo of honeybee from page of www.MonsantoHawaii.com. Monsanto Hawaii is committed to protecting the health of honey bees by taking into consideration the behavior and habitats of bee populations in our daily operations. One of every three bites of food we eat is from a crop pollinated by honeybees. Yet, over the past decade bee populations have been on a rapid decline. The National Agriculture Statistics Service has reported a drop in numbers from more than 5 million to less than 2.5 million honeybees. 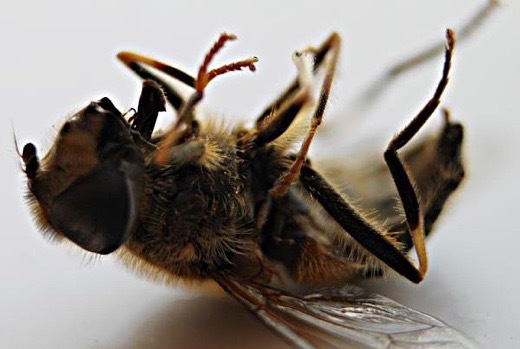 Scientists have dubbed the phenomenon Colony Collapse Disorder, or CCD, and have been searching frantically for a cause. A new study shows that glyphosate, the active ingredient in Monsanto's Roundup herbicide, can disrupt learning behaviors in honeybees and severely impair long-term colony performance. Glyphosate is commonly used in conjunction with genetically modified organisms, or GMOs, which have been engineered in a lab to survive massive applications of the herbicide. The most common herbicide-tolerant GMOs grown in the United States include corn, soy, and alfalfa. GMOs were first allowed into the food chain in the late 1990s. With the ability to blanket their fields in glyphosate, many US farmers have abandoned hand-weeding and controlled applications of the herbicide altogether. This has lead to a 527 million pound increase in the use of the chemical over the past decade. Glyphosate's toxicity is compounded by its persistence in the environment. Many studies show that glyphosate remains, chemically unchanged in the environment, for periods of up to a year. Recent research suggests that even when glyphosate binds to soil particles, it will cyclically "desorb" or lose its attraction to soil and become active again. A study by the US Geological Survey found glyphosate in nearly 70% of rivers and streams they tested in the Midwest. The scientists who conducted the new study used field-realistic levels of glyphosate, similar to what honeybees may encounter on a farm growing GMOs. They found that learning behavior and short-term memory retention decreased significantly compared with the control groups. And since bees don't die immediately when exposed to glyphosate, they bring the chemical back to the hive, where larvae come into contact with it. This means new bees will likely have lower overall foraging rates, which could have long-term negative consequences on colony performance. In fact, it could lead to the disappearance of the colony altogether. Although the creation of GMOs was initially hailed as a way to increase crop production and feed a hungry world, the loss of pollinators like the honeybee will have disastrous effects on the global food supply. According to the United Nations Environment Programme, of the 100 crops that provide 90% of the world's food supply, 71 are pollinated by bees. In the United States alone, the value of crops pollinated by honeybees is estimated to be worth more than $20 billion annually. Commercial beekeepers across the country are suffering astronomical hive losses, severely crippling their ability to meet pollination needs for a variety of crops. In fact, beekeepers have reported average annual losses of 40-50%, with some as high as 100%. Even as honeybee colonies collapse, the US Environmental Protection Agency is set to approve the use of a new combination of glyphosate with an even more powerful agrichemical known as 2,4-D. But instead of helping farmers meet increasing demand, expanded use of the chemical could backfire. Without pollinators, the entire backbone of the US agricultural system would collapse, leaving grocery store shelves empty and residents without access to affordable, healthy food. In many ways, the plight of the honeybee is a warning sign of the aftermath of chemically-intensive modern agriculture. Beekeeper Zac Browning, whose commercial operation spans three states, laments that "we're just about tapped out." "Without some real action we'll see this industry dwindle away." Image above: Incoherent photo of chemical drip system on page of www.MonsantoHawaii.com. A healthy ecosystem provides an environment that supports activities such as pollination, seed dispersal, climate regulation, water purification, nutrient cycling and management of pests. Monsanto’s proposed solution is to develop and seek regulatory approval for new engineered herbicide-tolerant crops to augment Roundup Ready crops. Predominant among these new engineered crops are those with resistance to two of the oldest herbicides, 2,4-D and dicamba. These herbicides may be more harmful in some respects than glyphosate. Both become volatile after application, which means they can spread to nearby wild vegetation—important for biodiversity and natural pest control—and to other susceptible crops. There is also evidence that 2,4-D may increase the risk of some types of cancer. Because of the volatilization problem, increased use of the old herbicides may also harm neighboring crops that are not resistant to them—including locally grown fruits and vegetables. A recent article estimates that risk to plants surrounding sprayed fields is from 75 to 400 times greater for the older herbicides than for glyphosate. The industry is working on formulations of these herbicides that may be less volatile, but that is unlikely to eliminate the problem—especially because the use of these herbicides is projected to increase tenfold. 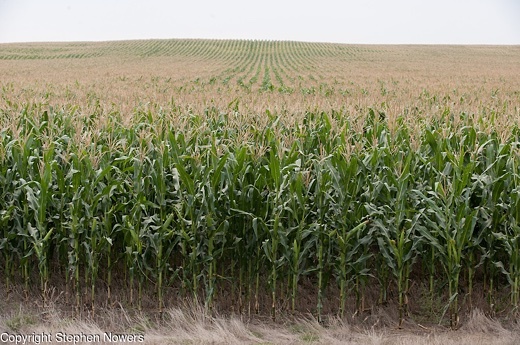 Damage to plant biodiversity near crop fields may also reduce the abundance and diversity of beneficial organisms that thrive in those habitats (but not in monoculture crop fields). Recent research has shown that when agricultural landscapes are simplified by the reduction of plant and beneficial organism diversity, much more chemical insecticide is needed to control pest insects. So if the volatilization problems are not eliminated, this “solution” to glyphosate resistant weeds may make matters worse, and may also lead to increased insecticide use—and possibly greater risk to people, especially farmers and farm workers.